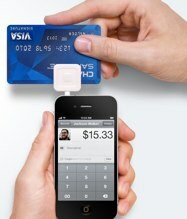 There is no doubt that mobile payments company Square is on a roll. The company just landed a lucrative deal selling its credit card readers in Apple’s retail stores and is growing at a fast clip. And now the company has just received a strategic investment from a giant in the credit card industry—Visa. For background, Square offers iPhone, Android and an iPad app which allows merchants to process and manage credit card transactions with a handy little credit card swiping device that plugs into the headset/microphone jack. The device and service is the brainchild of Twitter co-founder and recently appointed product lead Jack Dorsey and Jim McKelvey, and recently raised $27.5 million in new funding. In Q1, Square did $66 million in payment volume (the company expected $40 million) and plans to triple that in the second quarter of 2011. So clearly, Square probably doesn’t need the cash (Square declined to reveal how much Visa invested). This is a strategic investment, and one that gives Square major clout as a payments product. Simply put, it’s a huge stamp of approval for the startup. He tells me that as part of the investment, a Visa executive will become an advisor to the company. Square will also be adding an exec from bank J.P. Morgan Chase (J.P. Morgan participated in Square’s Series B round) as an advisor. So why Visa? Rabois says that while Visa is one of the giants in the industry based on reputation alone, roughly two-thirds of transactions using Square’s payments service are through Visa credit cards. He adds that over time, the partnership means that Square can work on making the payments experience better for Visa customers. For Visa, the investment gives the company access into the innovations taking place within the company and the mobile payments industry. In February, Visa published a glowing post, praising the startup’s product as a “big deal.” Back then, it was thought that Visa could be looking to partner with the startup or even acquire it. And on Square’s homepage, the company depicts a user swiping a credit card on Square’s mobile reader using a Visa Signature card. It is telling that Square chose to feature Visa, when the reader accepts MasterCard, American Express and Discover, which are all widely used across the globe. Visa has been steadily trying to ramp up innovation within its own payments network, launching a PayPal like payments service, and buying virtual goods monetization startup PlaySpan. But Visa hasn’t made many investments in companies in its history (the company invested in mobile commerce security and development company Ecrio back in 2007). Mobile payments is a business that a number of players are looking to profit from, including VeriFone and Intuit, and through the investment, Visa is able to gain insight into this emerging market. Another important angle to note in this transaction is that with the investment, Visa is standing by Square’s security as a credit card reader. Two months ago, VeriFone, which makes a competing card reader, wrote an open letter to consumers and the industry, warning users of a “gaping security hole” in mobile payments startup (and competitor) Square’s hardware. Dorsey shot back, vehemently denying the security flaw and calling out the apparent flaws in VeriFone’s argument. Still, being charged with putting consumer card information at risk is a serious accusation and certainly not one that Square wants associated with its name. Visa’s investment in the startup certainly validates the fact that there’s no credit card fraud taking place via flaws in Square’s devices and system. This has certainly been an eventful first half of the year for Square. Not only has the company signed a retail deal with one of the most well-known retailers in the world, but it has raised funding from a group of marquis investors, dropped the $0.15 per transaction charge for businesses using the mobile payments service, debuted a massive billboard in Times Square, and now has a strategic partner in one of the biggest credit card giants in the world, Visa.